Following JPMorgan's across the board beat, and Wells Fargo's latest disappointing results, moments ago Goldman reported a mixed set of numbers, with the company solidly beating on earnings, as EPS came in at $5.71, above the $4.89 expected, even as revenues disappointed, printing at $8.81BN, below the $8.99BN consensus exp., and down 13% from a year ago. As a result of declining revenues, total profit of $2.25BN declined some 21% drop from a year ago, if printing above the $1.97BN estimate. 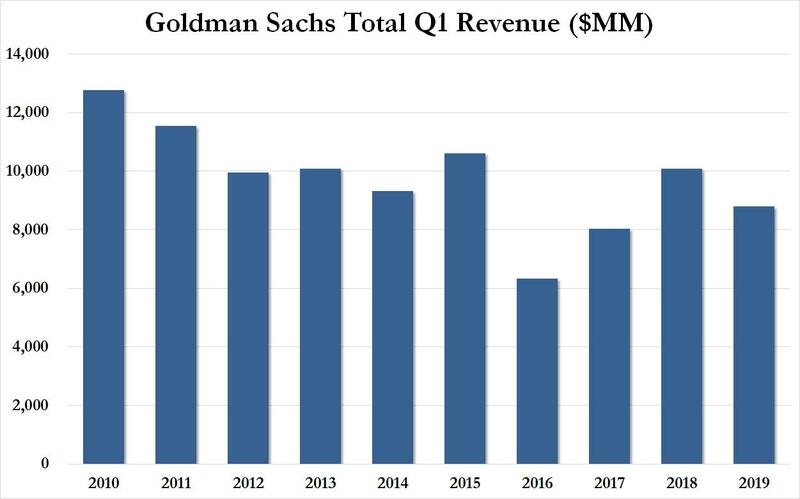 Of note, Goldman reported an effective income tax rate for Q1 of 17.2%, up from the full year rate of 16.2% for 2018, as the tax cut tailwind is now officially over. 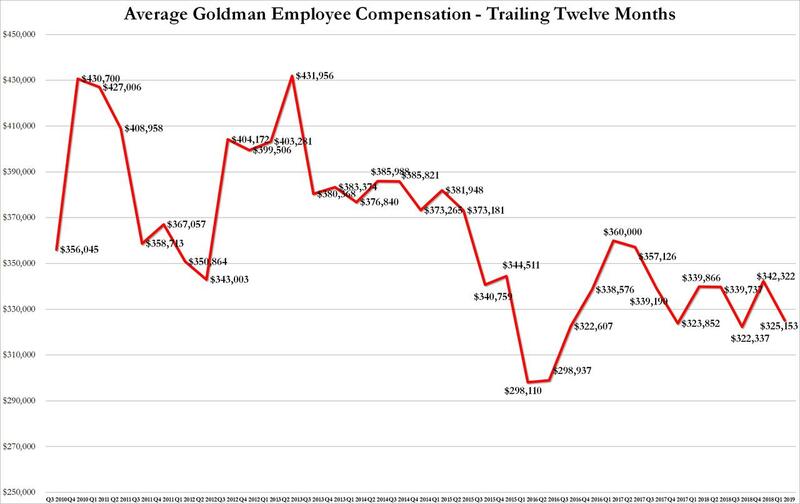 ... as trading revenue fell 18% to $3.61 billion compared with a year-ago quarter, mirroring a 17% drop at JPMorgan which reported quarterly earnings last week. 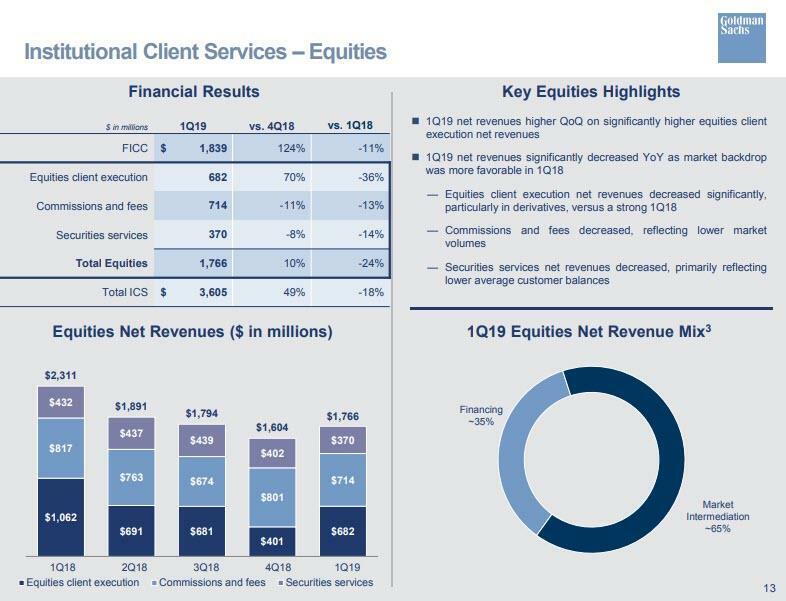 While trading disappointed on net, the biggest upside surprise came fromt he bank's investment banking segment, which were $1.81 billion for the first quarter of 2019, unchanged compared with the first quarter of 2018 and 11% lower than the fourth quarter of 2018. 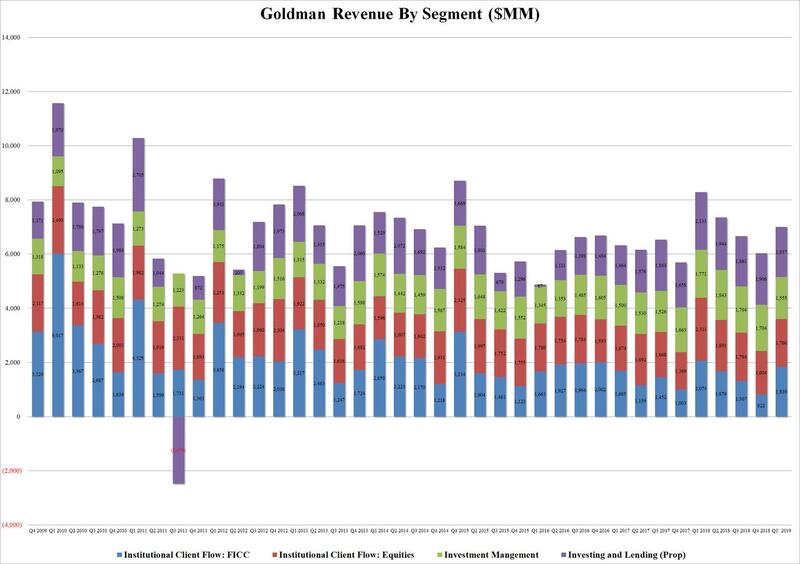 And even as net revenues in Underwriting was $923 million, notably, or 24%, lower than the first quarter of 2018, due to significantly lower net revenues in equity underwriting which generated $271MM in revenue, down 14% from a year ago, "primarily reflecting a significant decline in industry-wide initial public offerings, and lower net revenues in debt underwriting, primarily due to significantly lower net revenues from leveraged finance transactions," and debt underwriting also missed, at $652MM, below the $664MM a year ago, the most impressive aspect of Goldman's business was Financial Advisory revenues, which jumped to $887 million, well above the $819 million expected, and 51% higher than the first quarter of 2018, "reflecting an increase in completed mergers and acquisitions volumes." 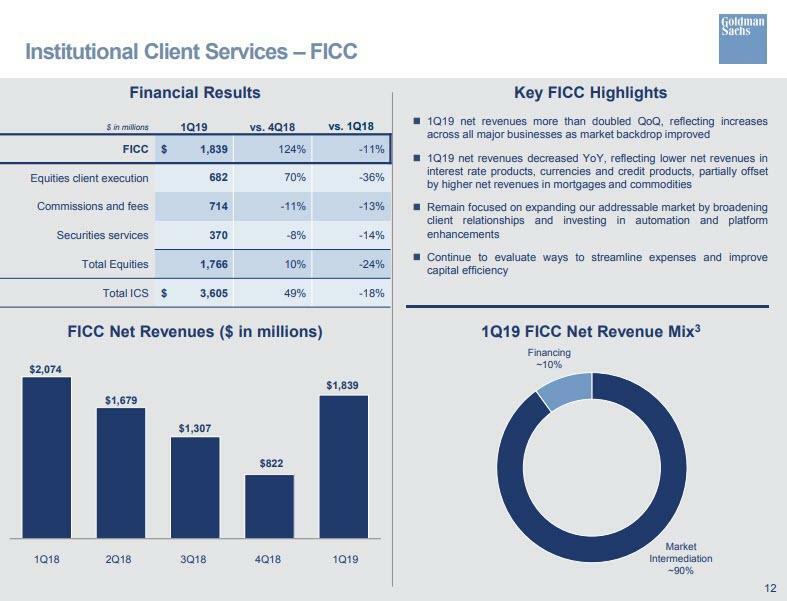 Investing and Lending revenue: $1.8 billion.